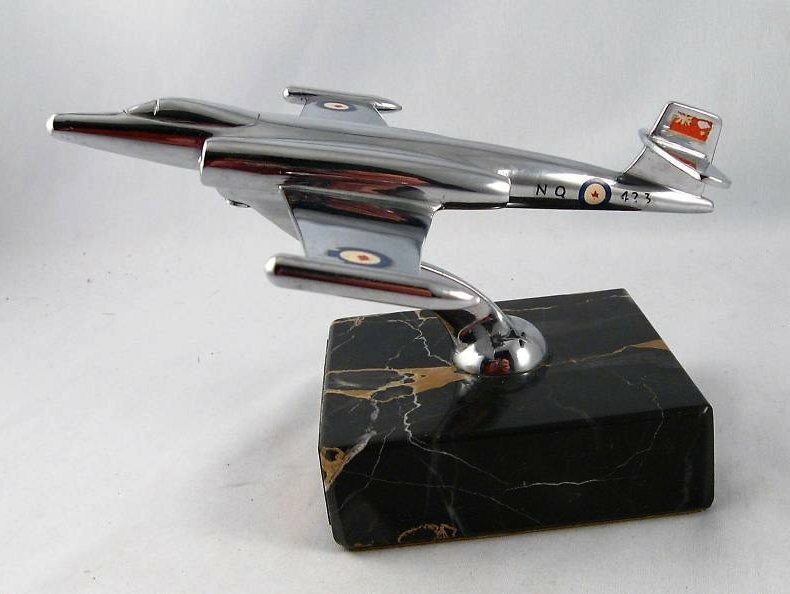 Another of my RCAF collecting interests are the models presented to the squadron departing members. 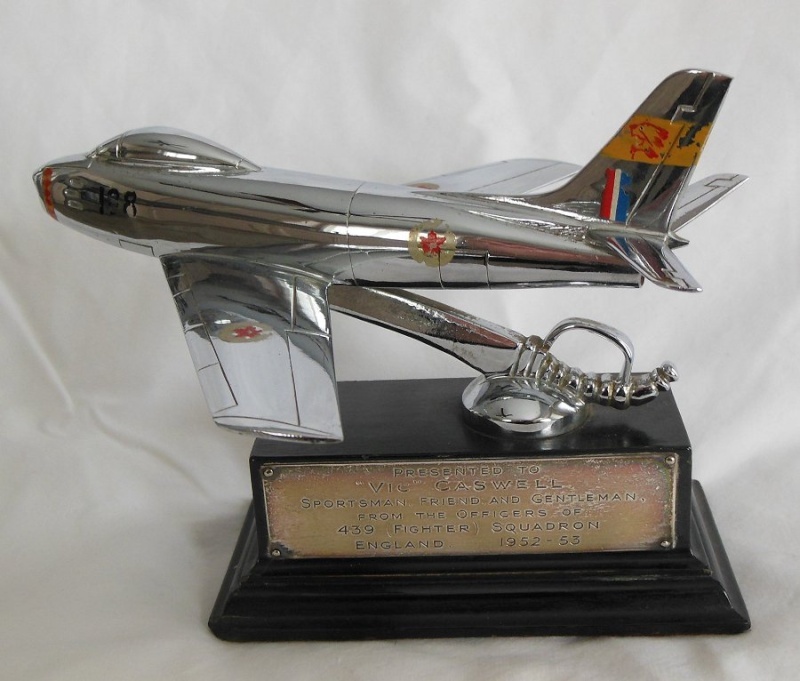 These models are normally of very high quality being chrome or silver plated, on a wood or marble base with a silver dedication plate affixed to the base. The scale of these models are normally about 1/72. 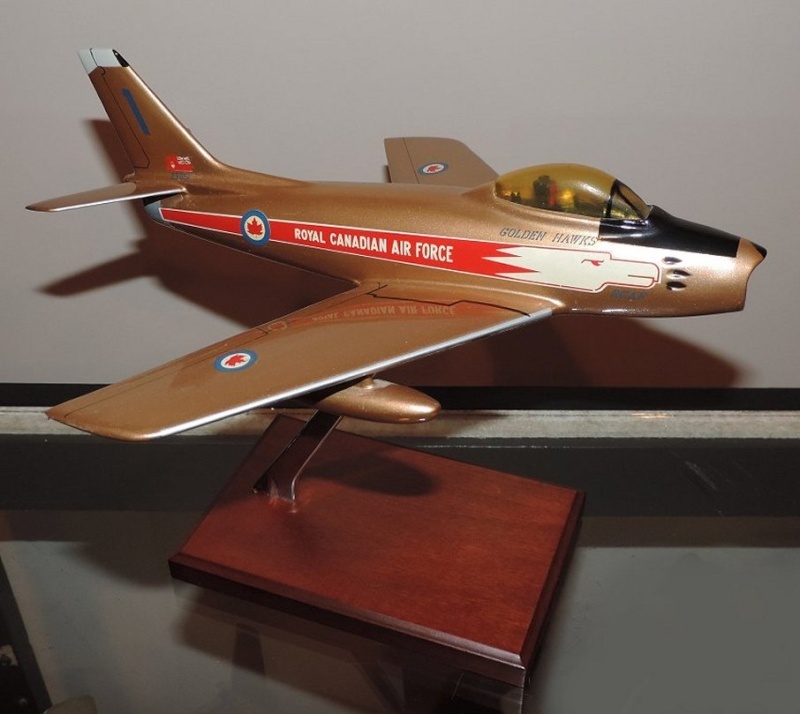 Here is the CF-100 Canuck model presented to F/L J.F. Belval of 423 (AW/F) Sqn. It is chrome-plated on a marble base with 423 markings. Unfortunately I have been unable to locate a photo of F/L Belval but from what I have read about him, he was a gifted aviator and came up with the idea for a "Cross of Lorraine" formation flypast for the people of Grostenquin, France where 423 Sqn was located. 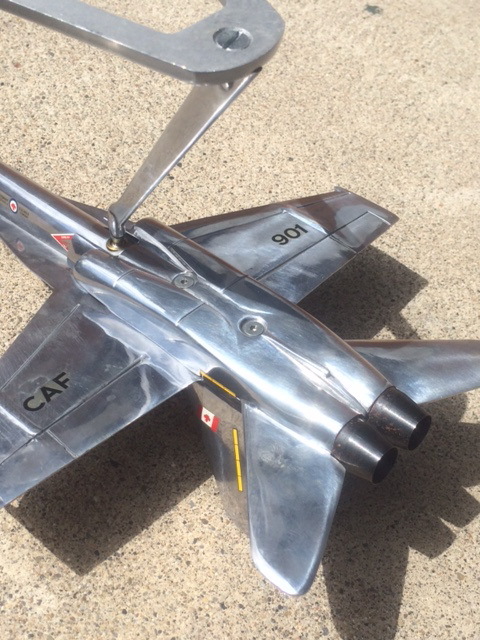 For the RCAF this base was called 2 Wing and operated both the CF-100 and the F-86 Sabre aircraft. Here is an excerpt from the official 423 Sqn history that tells about this formation. The squadron made a claim to fame in the fall of the year. 423 Squadron's prowess for formation flying dated back to its displays at the Toronto International Air Show, and was dusted off to create the "Croix de Lorraine" formation. 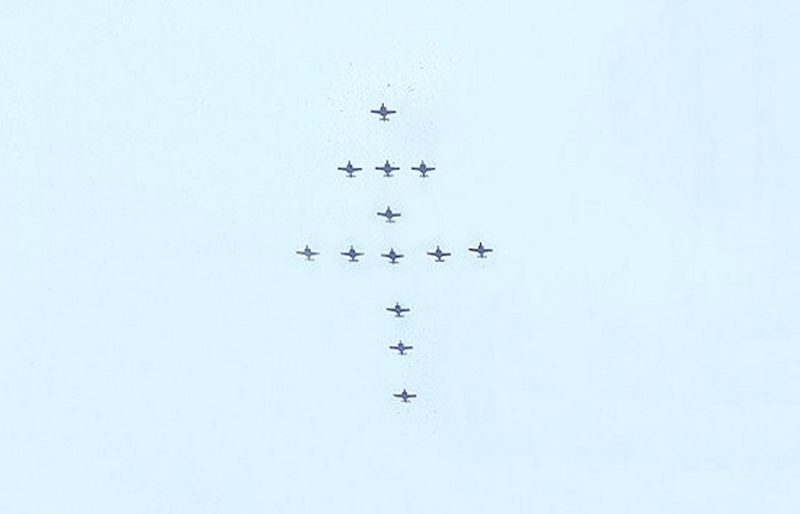 The formation was first displayed on "Friends Day" at Grostenquin on 9 July 1961. The formation was suggested by F/L Belval and presented to open the air show along with the French national anthem. Apparently it brought tears to some of the spectators. The unique spectacle was demonstrated again for the Grey Cup Game on 18 November, as it was for the visit of the retiring Chief of Air Staff, Air Marshall Hugh Campbell. The formation was led by the Squadron CO, W/C Buzza. The Franklin Mint models are nice too but I have a certain penchant for the old ones. Here is another example from my collection. 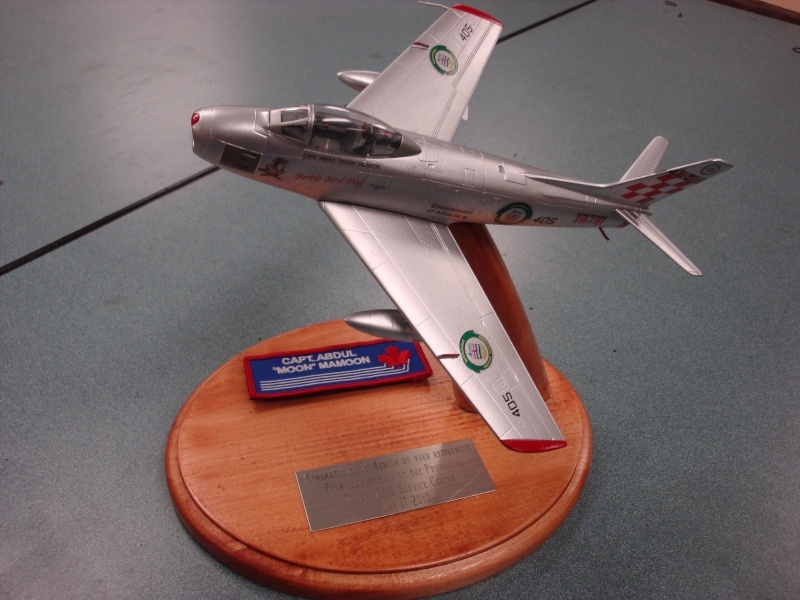 This F-86 Sabre model was presented to Mr. V.E. 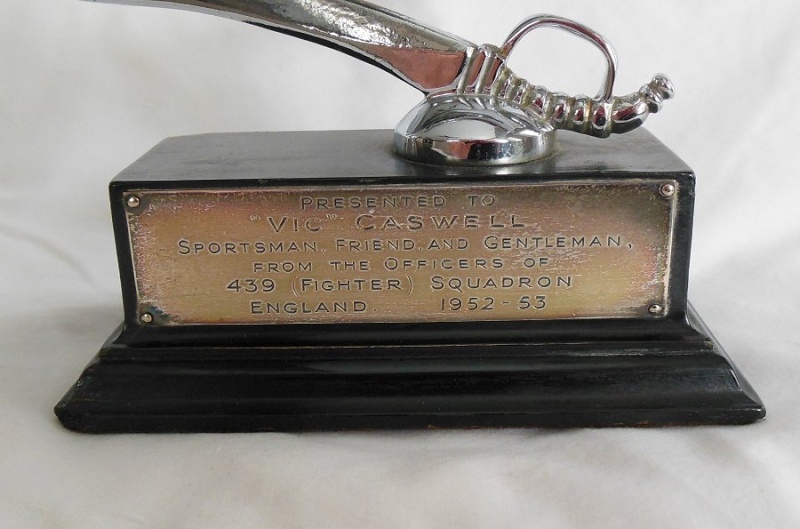 (Vic) Caswell by 439 Squadron in 1953. Vic was a former RCAF S/L and worked for Canadian General Electric as the Field Service Rep for the base at North Luffenham, UK. It appears that he was well liked and popular with members of the squadron. 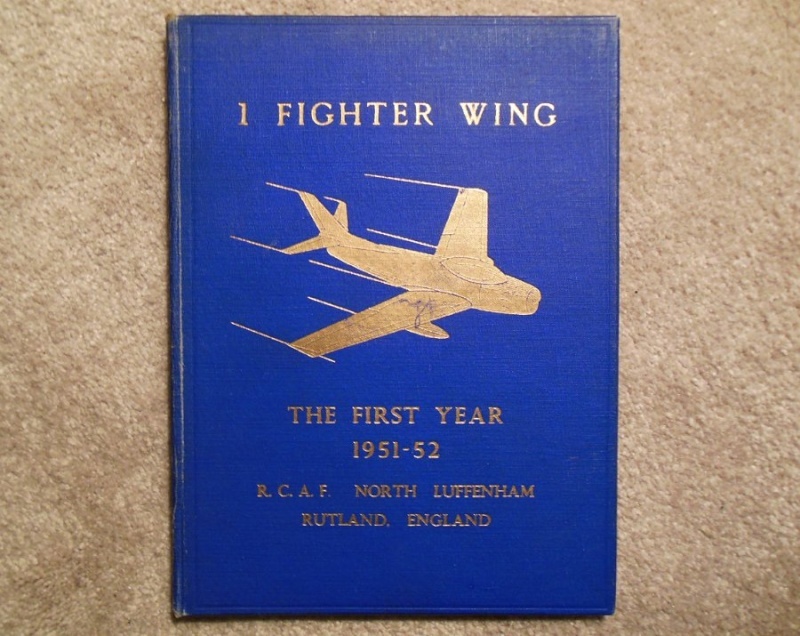 The model and 1 Fighter Wing history book came together from his estate. 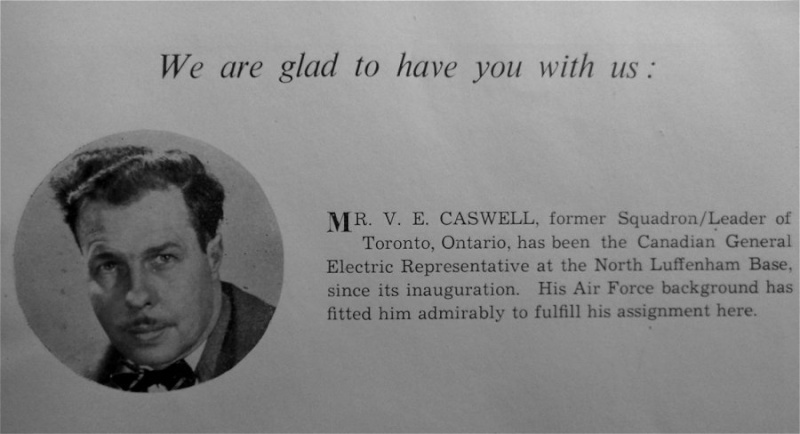 The short write-up on Mr Caswell is taken from the book. The pencil caricature drawing was something I came across on the internet and wish I could have obtained to include with this set of items. It's too bad when things like this get broken up. Here is the 1 Wing book and the write-up on Vic. 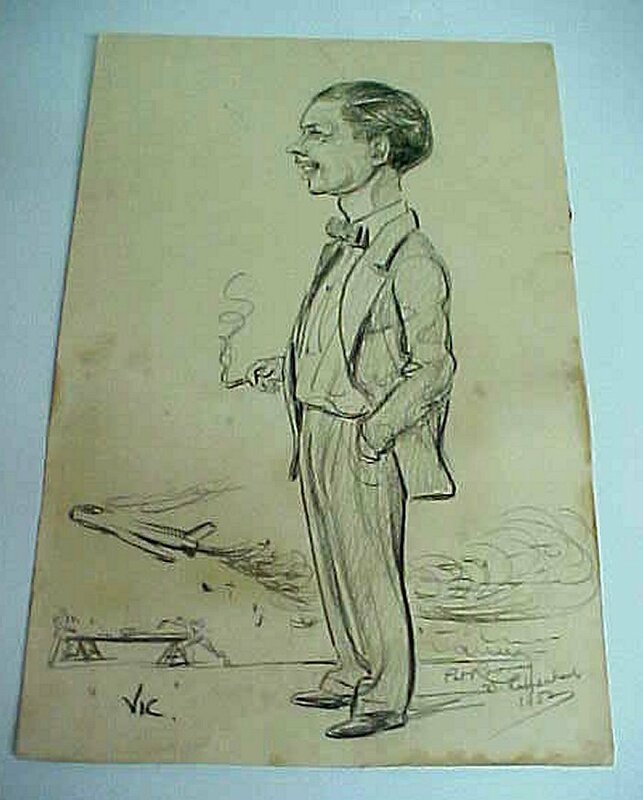 And...here is the pencil drawing of Vic. 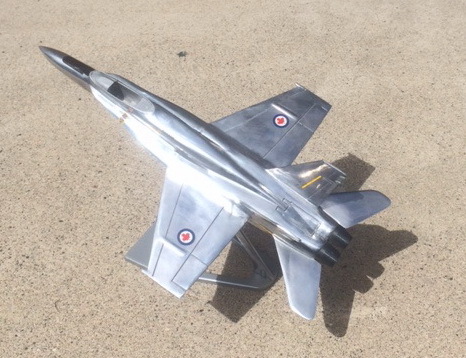 Very nice models, here is one I made for a friend, its not RCAF related but its a sabre. He was from Bangladesh and told stories of watching PAK Air Force Sabre jets and Indian Air Force jets fighting over his home town when he was a kid. This was his retirement gift. Nice job on the Sabre. I am sure your friend was duly impressed and thankful for the gift. 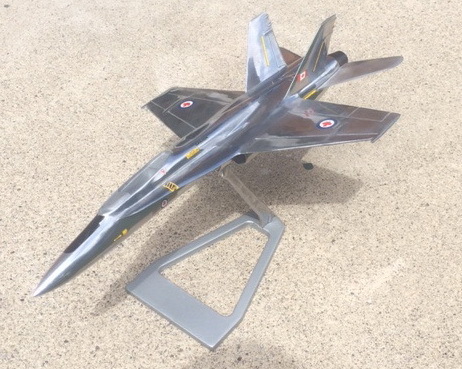 Here is another of my Sabre models; a Golden Hawk in metal by FOM-Aer of Italy. 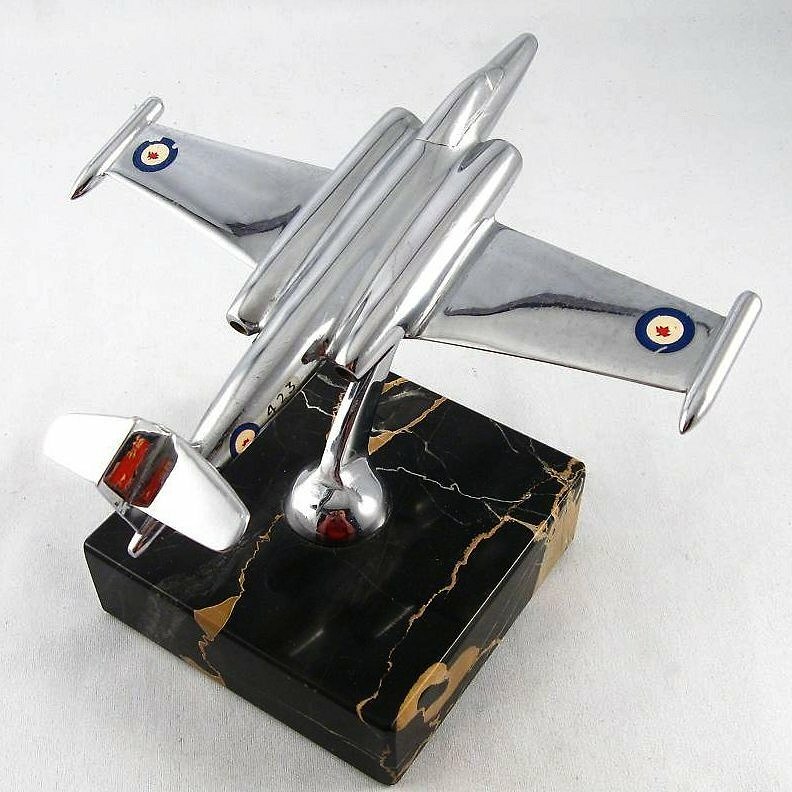 This company originated in Sardinia making aluminum and chrome models for the RCAF when they were in Decimomannu for weapons practice on the ranges located there. I don't have any proof but I believe this model to be from the early 1970s. 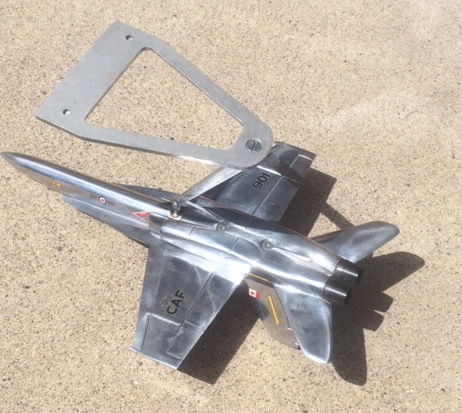 I picked this up on the weekend, its about 1/48 scale made from aluminum, no makers mark. It is very well made, and has a swivel ball so the aircraft can be displayed at any angle. I wonder if these are cast from actual aircraft aluminum? Its missing the canopy but I should be able to find an aftermarket one for a 1/48 scale model.